Trigot is a beautiful modular typeface. It is known for its unique style wherein each form and every character is developed carefully from the basic geometric form of the triangle. The construction is very simple and the font holds a striking resemblance to an ancient gothic black letter font. 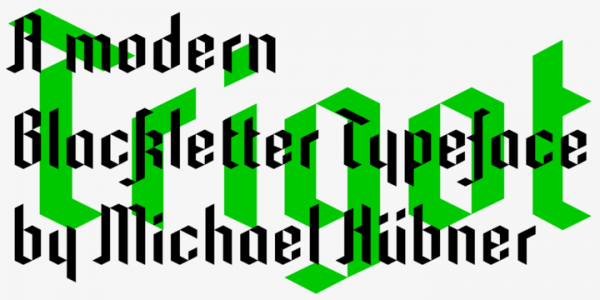 The letters for this unique font are inspired by the ductus and typical forms of medieval typefaces. Interestingly, the font has a complex expression similar to these forms. The singularity of of this marvellous font lies in the strong contrast between clear geometry and the intricate expression of a black letter typeface. The name, “Trigot”, insinuates the gothic sway and the typical triangular modules of the font. Trigot is definitely a contemporary display font. One can use it for a variety of purposes including posters, developing unique titles, and striking visuals. This is not all. The font can also be used for creating longer phrases and striking quotes. All in all, a unique attractive font targeted precisely for modern users.